I recently brought cupcakes to a coworker’s going away party. I tricked her into telling me that one of her favorite desserts is coconut cupcakes — well, not sure I had her fooled, I think she just went along with it, but that’s cool — then I set about finding the perfect recipe to test out. I adjusted a basic cupcake recipe to include both flaked coconut and coconut milk in the batter, and topped half with (what else?) a coconut cream cheese frosting and the other half with a chocolate coconut frosting. 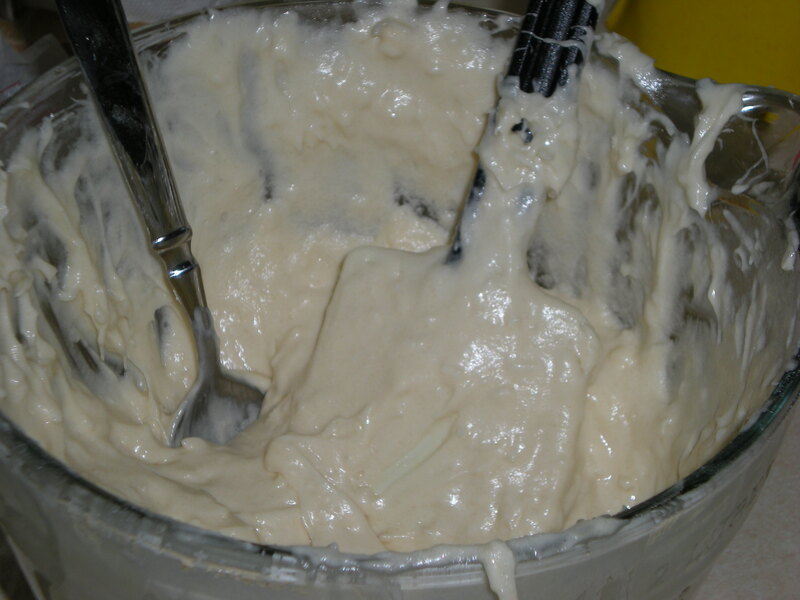 For the cake: In a large bowl, I used the hand mixer to cream together 2 cups white sugar and 3/4 cup butter. I added 3 eggs and beat well. In another bowl, I whisked together 2 1/2 cups all-purpose flour and 2 1/2 teaspoons baking powder. 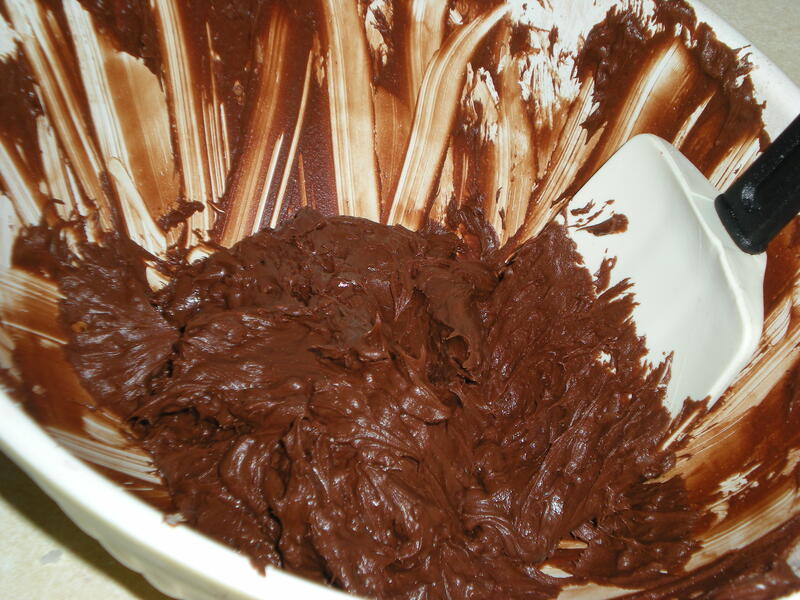 I added this mixture into the butter mixture, alternating with adding 1 cup coconut milk. I added in 1 teaspoon vanilla and then beat the entire thing well. 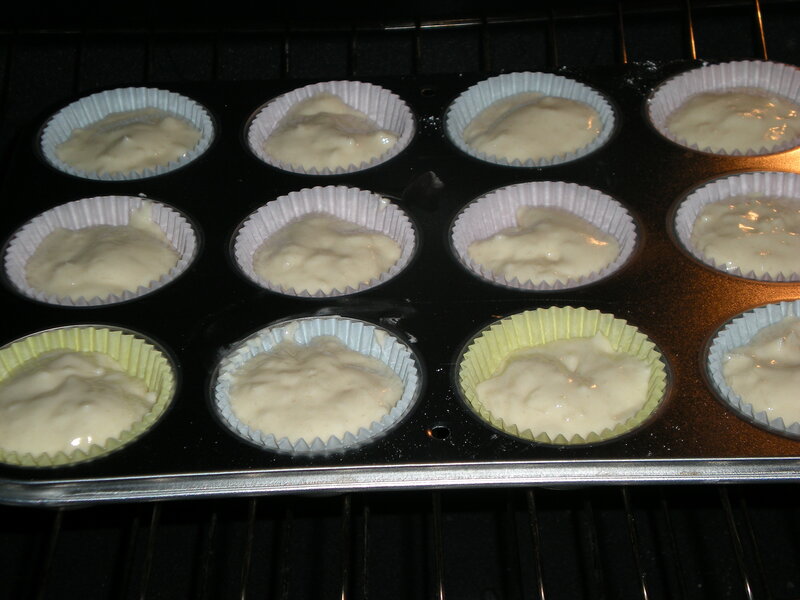 I filled a muffin pan with cupcake paper liners and filled the muffin tins about 2/3 of the way with the batter. Then I baked them at 350 degrees for about 18-20 minutes (a toothpick came out clean when I poked them). I let them cool completely and then covered half of them with a coconut cream cheese frosting. 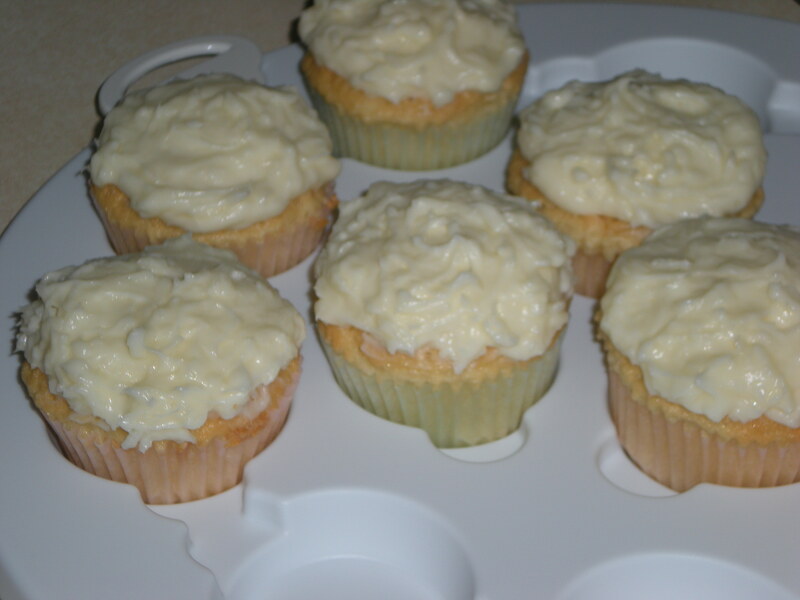 This was super easy: I made my standard cream cheese frosting, adding 2 tablespoons coconut milk when I mixed it up. After it was mixed, I stirred in 1/2 cup shredded coconut. Yum! For the other half of the cupcakes, I covered them with a super-rich chocolate coconut frosting. Double yum! 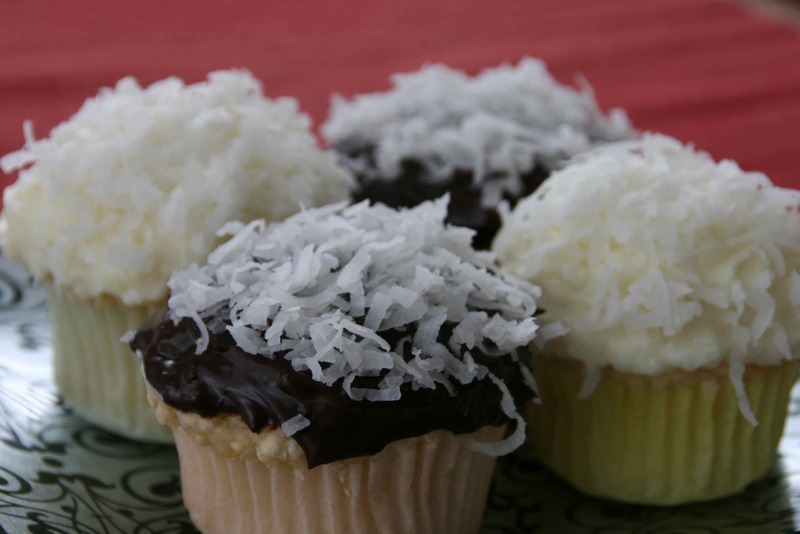 To make sure the coconut flavor was strong enough, I topped all the cupcakes with extra shredded coconut. Don’t skip this step! The flavors of the cake and the two frostings can really outweigh the coconut flavor without the extra on top. At the party, I set up my cupcake tower and alternated the cupcakes in a black-white-black-white pattern. It looked super awesome! I really like these because the coconut is there, but not too strong. They also looked really cool alternating between black and white cupcakes on display. But frankly — and this may just be the chocoholic in me — the best part of this project was the chocolate frosting. those are gorgeous cupcakes. did you save me one? p.s. 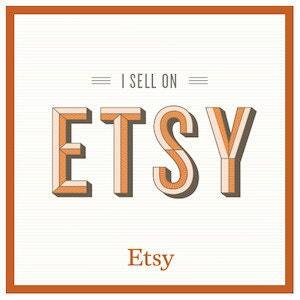 i nominated you for the Stylish Blogger Award because well, your stuff is just fabulous! Check out my post today to accept & pass on the award to your favs!